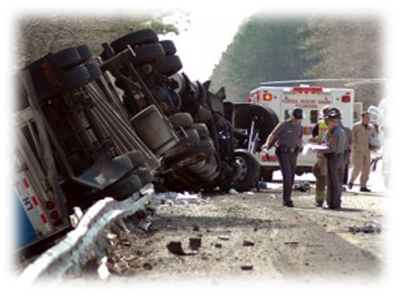 Lateral Force Rollovers – Vehicles with high centers of gravity are most susceptible to this type of rollover, which happens when a driver turns the vehicle while traveling too fast. Sideways Skid (and Trip) Rollovers – This type of rollover happens when a driver loses control of the vehicle and it begins to slide slideways. The tires hit and get stuck on a curb, guardrail or another object, but the vehicle’s body keeps moving, causing the rollover motion. Ramp Rollovers – When one side of a vehicle drives up onto an object, it’s usually a guardrail, and the other part stays on ground, a ramp rollover occurs. Alcohol impairment, speeding and loss of control are the main factors that contribute to this particular type of rollover collision. Side Slope Rollovers – The slope of ground under the vehicle causes side slope rollovers, which means it usually happens when a vehicle drives off of the road onto or over an embankment. Check and maintain tire pressure, which can improve traction and fuel efficiency, decrease braking distance, and increase your tires’ lifespan by reducing wear. Inclement weather – Slow down and adjust your driving style when roads are covered in snow, ice and/or rain. Lowered levels of visibility can also contribute to rollover accidents. Poorly maintained roads – Watch for drop-offs and roadway barrier design. Winding or narrowing roadways – You’re more likely to get into a rollover on a rural road or highway – the narrower the road, the bigger chance of a rollover, because of the smaller room for driving errors. Don’t drive when you’re tired. Always pull over when you’re feeling sleepy. Try to get enough rest before trips to avoid fatigue when you’re out on the road. Stay calm – Don’t over-correct when you’re in a panic, this can often cause a more dramatic accident then it would have been otherwise. Stay alert – When drivers let down their level of attentiveness and fail to anticipate bad road conditions. If your vehicle is carrying more passengers than it is made to carry, it can contribute to a rollover. Cargo that’s been loaded poorly into the vehicle can shift and affect its center of gravity, resulting in a rollover. What steps do you take to avoid rollover collisions? Share with us in the comments below.